Embrace the rhythmic beat of a Caribbean night as you gently sway to a steel band. 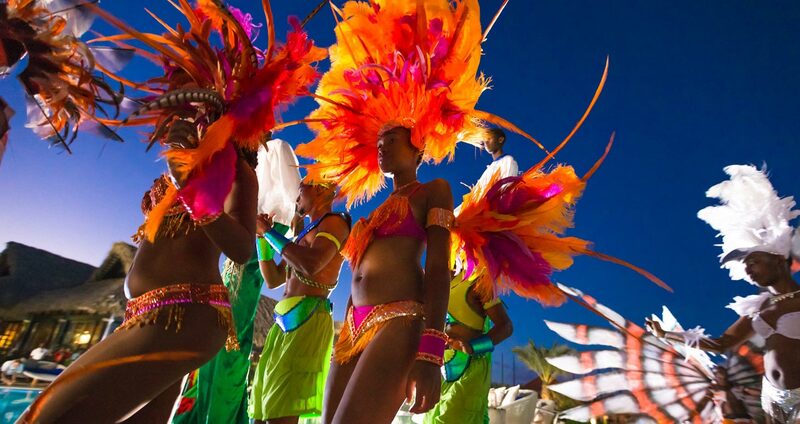 Night shows feature the excitement of top-rate entertainers and the thrill of authentic island culture. And during talent night, the tables turn and it's you that becomes the star. Whether you take yours straight-up, on the rocks, or expertly mixed with your favorite flavors, unlimited premium liquor is always available at one of our many "open bars." If you are staying in any of our Club Suites, premium spirits are also included (and replenished daily) in your in-room bar. By day, white-sand beaches, shady divans, and Caribbean rum concoctions are the inspiration for high-spirited gatherings. When the sun goes down, the night is transformed into something magically exotic with acrobats, fire-eaters and beach party extravaganzas that feature endless culinary delights.